Hi, my name is Rudolf Farkas. As you may know, I am passionate about fine arts. I have been a painting artist for over 35 years and a freelancer illustrator since 2006. 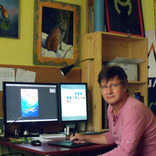 Therefore, I have extensive experience in creating oil paintings and digital illustrations for children books. Over the past 10 years, I worked on numerous projects with various well-known publishers such as Bloomsburry Publishing, Cambridge University Press, Harper Collins Publishers, Igloo Books Ltd., Oxford University Press, Penguin Random House, Weldon Owen Publishing,Ravensburger Company. One of my strengths is realistic representation. However, my interests vary from historic topics to flora and fauna. As a professional artist, I always welcome new challenges and I really enjoy coming up with creative ideas.